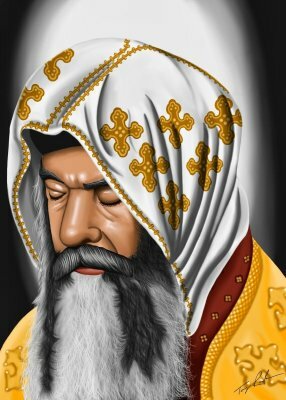 Pope Kyrillos VI is among the most beloved of the Coptic saints, and is a true blessing to our generation. He was born on August 2, 1902 and was called Azer Ata. At the age of 25, he resigned his job and entered the Monastery of El-Baramous. There, he was ordained monk and named Mina after the name of his patron saint, St. Mina. Owing to his great love for God, he desired a life of solitude and lived in cave near the monastery as a hermit when he was only 30 years old. He then moved to a deserted windmill in El-Moukatam mountain at the outskirts of Cairo. The windmill was totally abandoned and very dangerous, but Father Mina (Pope Kyrillos) lived there, trusting in God and His protection. He then built a church in Old Cairo and named it after his beloved Saint Mina. He lived in that church till his ordination as Pope on Sunday May 10, 1959 when he was named Pope Kyrillos VI. The pope abolished all barriers between him and his flock. As a result, one could meet the pope whenever in need, even if he was sick or even if one came by night while everybody else slept. When he was asleep, his patron saint, Saint Mina, would often wake him up, as Father Raphael Ava Mina, Pope Kyrillos’s disciple and private deacon, once narrated. The number of documented miracles performed by Pope Kyrillos and his patron saint, St. Mina, is immense. It is said that nearly every person who lived in the days of Pope Kyrillos witnessed a personal miracle, and his miracles continue to this day. Pope Kyrillos sat on the See of St. Mark for about 12 years, during which he accomplished great deeds, including the return of the relics of St. Mark the Apostle from Italy, the establishment of the Monastery of Saint Mina at Mariout and of the new Cathedral of St. Mark at Anba Rouis. It was also during his blessed era when Virgin Mary appeared on the domes of her church at Zeitun, and millions of people saw her. Pope Kyrollos departed to heaven on March 9, 1971. According to his will, his body was buried in St. Mina’s monastery at Mariout where millions of faithful Copts visit every year to get his blessings. May his prayers be with us all, Amen !